There are several tools that are must have items in every knitter's bag - and good measuring tape is at the top of the list. 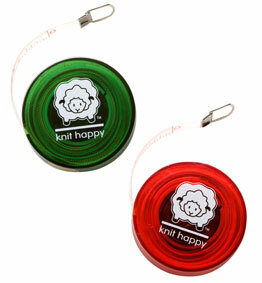 These Knit Happy measuring tapes are not only functional, but also adorable and come in fun colors. Featuring a translucent case and a 60" (150cm) x 1/4" flexible tape that auto locks at every inch, the center push button quickly and neatly retracts the tape back into its case.